High-speed Internet access won’t be available everywhere, but Amtrak says users will have a better Wi-Fi experience. WASHINGTON — After years of criticism of the wireless service on its trains, Amtrak announced Thursday that it had upgraded its cellular-based Wi-Fi offering using broadband technologies that will improve the speed and reliability of the Internet in its passenger cars. Amtrak’s Wi-Fi has been the target of technology jokes since the railroad introduced the service, with some passengers comparing it to dial-up services like America Online or Prodigy. Others have praised the service, however, saying it allowed them to be productive while traveling between cities, unlike airline travel. The railroad said the broadband upgrade was complete on the high-speed Acela trains that travel the more than 400 miles between Washington and Boston. Several state-supported routes in California have also been upgraded. Amtrak said it would roll out the upgrades to all remaining Amtrak trains equipped with Wi-Fi, including the Northeast Regional, by late summer. “We continue to place a strong focus on improving customer satisfaction, and this upgrade is delivering the improved speeds and connectivity required to maintain a competitive edge,’’ Deborah Stone-Wulf, Amtrak’s chief of sales distribution and customer service, said in a statement. 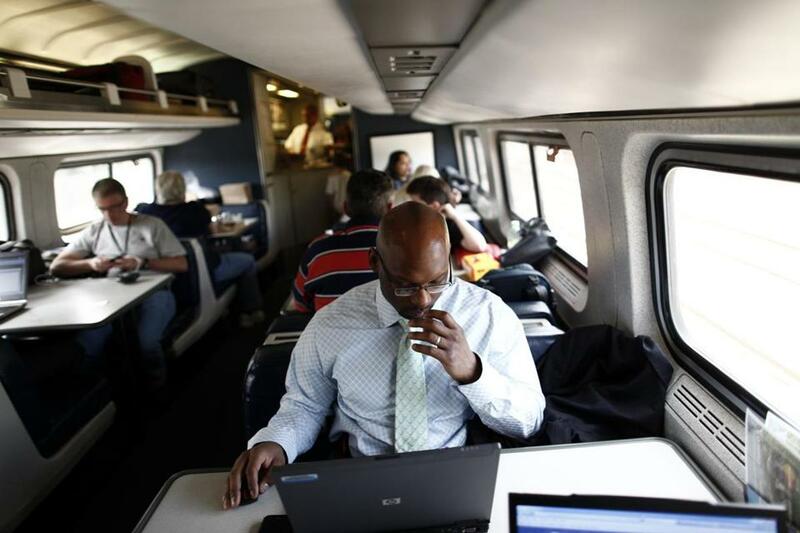 Unlike most airlines, Amtrak said it would continue to provide the Wi-Fi service for free. The railroad said that Wi-Fi was available on trains that serve 75 percent of Amtrak passengers, and that it routinely supported 30 percent to 50 percent of the passengers on a given train. Amtrak also said, however, that it would continue to limit some Internet activities. To ensure that all passengers have an opportunity to use the Wi-Fi service, Amtrak said, it would still restrict data-heavy activities that could slow the service, such as streaming video sites like Netflix and music sites like Pandora. The railroad will also restrict file downloads larger than 10MB. Even with the upgrades, Amtrak will continue to face some challenges with its wireless service. High-speed service is not available everywhere, and because the railroad uses different carriers along its routes, including Verizon and AT&T, service could still be interrupted or slowed as the Wi-Fi signals switch between the two carriers. In addition, as the speed of the service increases, so will the number of people trying to use it, potentially slowing it down.